I was never much of a crier, until I had babies… my hormones have been in chaos ever since! So, today I told myself I wouldn’t cry. Today is her last day of pre-school and for their party I signed up for fairy cakes! 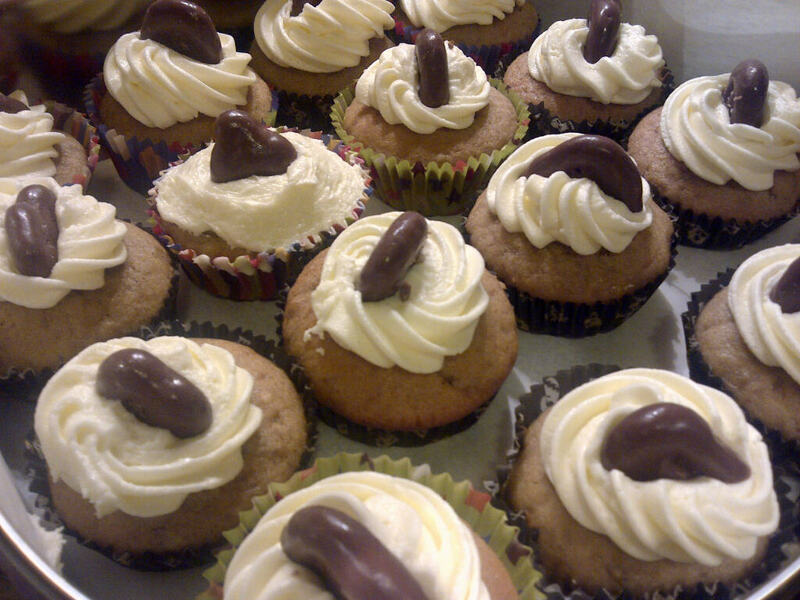 I made banana cupcakes in fairy cake cases. There is a difference. This recipe would normally make 12 cupcakes I managed 30 fairy cakes! Now that it is officially summer time, as school is finally done, we need the weather gods to give us some sunshine! I won’t hold my breath! So, if you’re in England and holed up in your house you can make these!! Pre-heat the oven to 180C/350F/gas4 and line your muffin tin. Cream the butter, brown sugar, and banana extract (if using, I didn’t) for 7 minutes, or until light and fluffy! In a separate bowl mix all the dry ingredients: flour, b.powder, bicarb, salt, and g.cinnamon. Mix into the butter mixture until just incorporated. Divide into your paper cases in your lined tin and if you are making cupcakes bake in the pre-heated oven for 25 minutes. If you are making fairy cakes, like I did, only bake for 15 minutes or until a toothpick comes out clean. NOTE: be aware that the bananas in the cupcake could cause a toothpick to come out a bit wet so check a few cupcakes! Out of the oven transfer to a rack and leave to cool before icing! Cream the butter in the mixer until light and fluffy I found this hard, as it wasn’t enough butter for my mixer to mix properly. You may want to use a hand mixer for this icing! Add the icing sugar, milk, and honey and mix for 2 minutes until well blended. I piped my frosting on, but you could also use a palette knife! I then added a chocolate covered banana chip! The recipe suggests a couple of sliced bananas covered in a tsp of honey (1 tsp for each cupcake) remember if you make fairy cakes you could use less. I shared these on Homemade Hooiser's Cupcake Tuesday!! Button on the side bar! Janet made Martha's Roasted Banana Cupcakes if you're looking for an alternative! !